Eating before workouts leads to cramping. If painful stomach cramps make you want to curl up in bed after each workout, you're not alone -- side stitches and other types of belly aches are common after intense aerobic sessions. However, you don't need to skip out on exercise for fear of post-cardio pain. With a few simple steps, you can prevent this nuisance from cramping your workout style. Limiting food before workouts can help kick belly woes to the curb. Navy SEAL trainer Stew Smith recommends not eating -- as well as not drinking large amounts of liquid -- for 2 to 4 hours before exercise. Dehydration also contributes to cramping, however, so sip water before, during and after your workout, taking only a mouthful or two at a time and stopping before you start to feel full. Electrolyte imbalance may also cause cramping, which is most common during prolonged workouts that cause you to sweat out salt and other minerals; in these cases, sipping a sports drink instead of water may help. In addition, avoid high-fiber foods, such as broccoli and beans, before workouts because they can cause painful gas. Strengthening your core with exercises such as crunches and planks may help prevent cramping during cardio. In addition, you can help stop cramps as they occur by pausing your activity, stretching your abs and taking a few deep breaths -- then throw in a quick massage for even greater relief. It also may help to perform stretches before intense cardio sessions -- but stretching cold muscles can actually hurt them, so get 5 to 10 minutes of light activity in first. It may be tempting to pop a pill after workouts to squelch the pain, but not so fast, because anti-inflammatory drugs such as ibuprofen and aspirin may upset your stomach even further. If you don't want to ride out the pain, stick with acetaminophen, which has analgesic effects but doesn't fight inflammation. Cardio is one trigger of abdominal pain, but cramps may also signify something more serious. If the pain grows more severe after you've unlaced your gym shoes, it's time to seek medical assistance. Ditto if the cramps stay for more than a day or two, come with bloating that lasts more than 2 days or are accompanied by vomiting, vaginal bleeding or fever, reports MedlinePlus. If you were previously sedentary and are just starting a new cardio routine, you should also check with your doctor to get the medical all-clear. 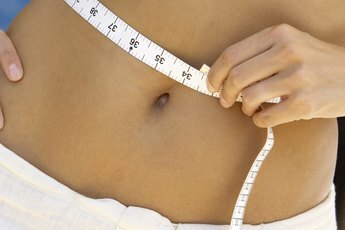 MedicineNet.com: Ask the Experts: What Causes Abdominal Cramps During Exercise?